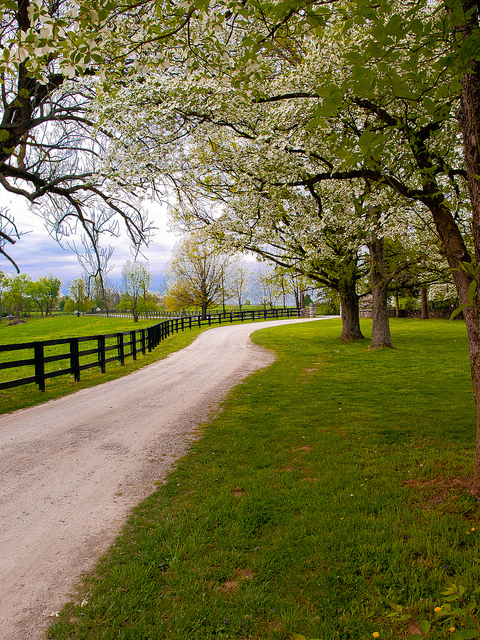 Kentucky bluegrass country (Woodford County); photo by David Cornwell on Flickr (noncommercial use permitted with attribution / no derivative works). 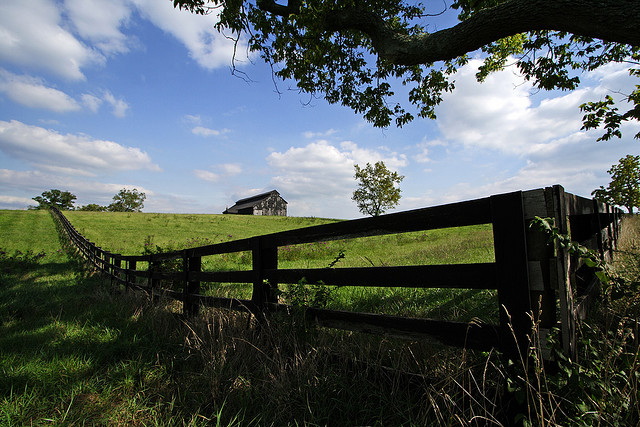 Kentucky's nickname is The Bluegrass State, based on the fact that bluegrass is found in many of the lawns and pastures throughout the state (particularly in the northern part of Kentucky - including the metropolitan areas of Lexington and Louisville). "Bluegrass" is the common name for grass of the genus Poa, which is a favored lawn and pasture grass in the eastern United States from Tennessee northward. Bluegrass is actually green - but in the spring bluegrass produces bluish-purple buds that give a rich blue cast to the grass when seen in large fields. Early pioneers found bluegrass growing on Kentucky's rich limestone soil and traders began asking for the seed of the "blue grass from Kentucky." The Bluegrass Region, which extends into southern Ohio, is characterized by underlying fossiliferous limestone, dolostone, and shale of the Ordovician geological age. Hills are generally rolling, and the soil is highly fertile for growing pasture. The Bluegrass Region is famous for its horse farms and of course the Kentucky Derby (the thoroughbred is the official state horse of Kentucky. However, the area is becoming increasingly developed with residential and commercial properties, particularly around Lexington. Farms are losing ground to this development and are slowly disappearing. This has led the World Monuments Fund to include the Bluegrass Region on its global list of 100 most endangered sites. Regions of Kentucky showing Bluegrass regions in green and light green (public domain image on Wikipedia).